Rhoemetalces II was a Client Ruler in association with his mother Antonia Tryphaena of the Odrysian kingdom of Thrace under the Romans from 18 to 38. 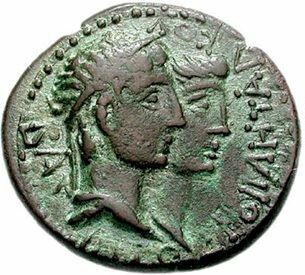 On coinage his royal title is in Greek:ΒΑΣΙΛΕΥΣ ΡΟΙΜΗΤΑΛΚΑΣ or of King Rhoemetalces. Rhoemetalces II and Tryphaena succeeded his paternal great-uncle Rhescuporis II, who had usurped the throne from Rhoemetalces II's father Cotys VIII. The Roman Emperor Tiberius deposed Rhescuporis II and installed Rhoemetalces II and Tryphaena on the throne in his place. Rhoemetalces II never married and had no children. After his death in 38, his cousin Rhoemetalces III, the son of Rhescuporis II, was appointed king, while his mother retired to live as a private citizen in Cyzicus.